Austin, Texas – Texas Moratorium Network is holding an international, all-media, juried art exhibition entitled “Justice for All? : Artists Reflect on the Death Penalty” in Austin at Gallery Lombardi from May 6-22, 2006. 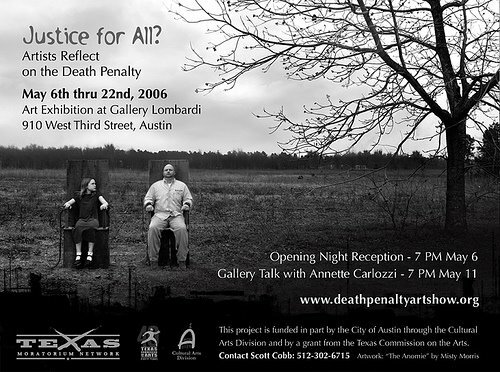 The purpose of the art show is to foster the creation of new artwork on the death penalty and to encourage and enhance civic engagement and dialogue about the death penalty. The opening night reception is May 6 at 7 PM. There will be a gallery talk on May 11 at 7 PM, conducted by Annette Carlozzi, Curator of American and Contemporary Art at the Jack S. Blanton Museum Museum of Art at The University of Texas at Austin. Media representatives may arrange for a pre-show visit to the gallery on either May 4th or 5th by calling Scott Cobb at 512-689-1544. Jurors for the art show were: Annette Carlozzi; Lora Reynolds, owner of Lora Reynolds Gallery in Austin. Lora Reynolds Gallery presents contemporary art in all mediums by established and emerging, national and international artists; and Malaquias Montoya, an artist and professor of art at the University of California, Davis. More than 300 artists submitted around 700 pieces of artwork for the jury to consider. There were submissions from 38 U.S. states and 19 countries. Artworks on display will include sculpture, paintings, video, photography, and installation art. There will be 54 works on display from 50 artists. The exhibition includes art from 13 artists currently on Texas death row, one person whose Texas death sentence was commuted to life in 1972, and one person whose death sentence was commuted to life by Governor Ryan of Illinois. Using an innovative system provided by a company called Guide by Cell (www.guidebycell.com), visitors to the art show will be able to listen to audio recordings about individual artworks by calling a number on their cell phones and punching in a number corresponding to the artwork they are looking at. In most cases, the descriptions will be recorded by the artists themselves. Visitors to the exhibition will also be able to share their own thoughts on the art work by recording their own statements, which will be posted on the website at www.deathpenaltyartshow.org. This art show is funded in part by the City of Austin through the Cultural Arts Division and by a grant from the Texas Commission on the Arts. List of artists whose work was selected by the jury to be exhibited at Gallery Lombardi, May 6-22, 2006.